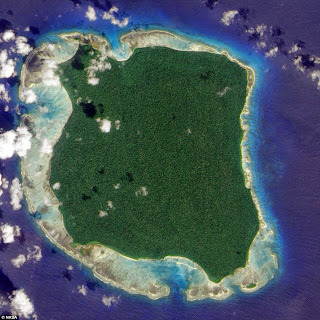 The indigenous tribe has lived on North Sentinel Island in the Indian Ocean for an estimated 60,000 years. Their limited contact with the outside world usually involves violence, as they are hostile towards outsiders. Islanders have been known to fire arrows or toss stones at low-flying aircraft on reconnaissance missions. Tribespeople have rarely been photographed or recorded on video, as it is too dangerous to visit the island. India's government has given up on making contact with the islanders and established a three-mile exclusion zone. 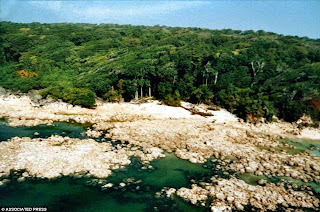 From the sky it appears to be an idyllic island with amazing beaches and a dense forest, but tourists or fishermen don’t dare to set foot on this outcrop in the Indian Ocean due to its inhabitants’ fearsome reputation. 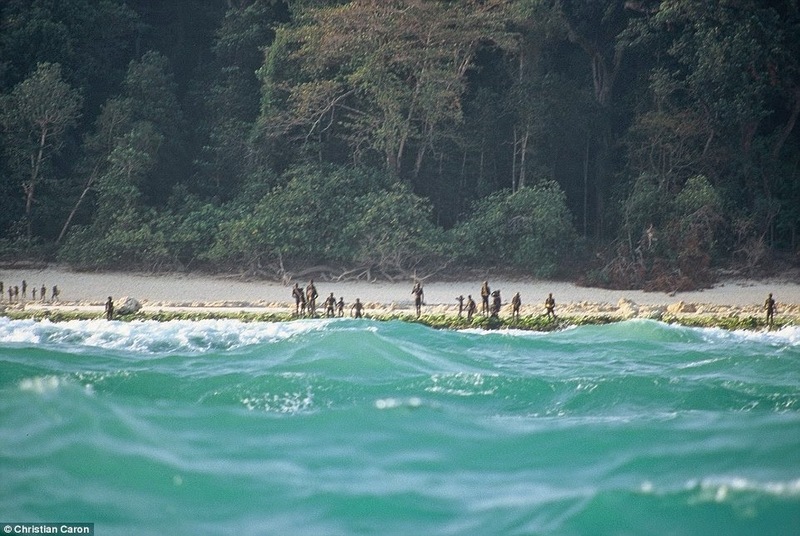 Visitors who venture onto or too close to North Sentinel Island risk being attacked by members of a mysterious tribe who have rejected modern civilisation and prefer to have zero contact with the outside world. [Left] Following the 2004 tsunami this member of the Sentinelese tribe was photographed firing an arrow at an Indian Coast Guard helicopter. 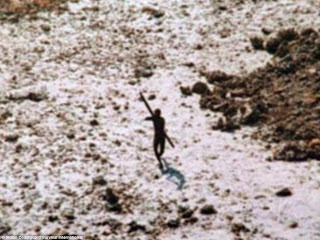 When they do interact with outsiders, it usually involves violence – the indigenous Sentinelese tribe killed two men who were fishing illegally in 2006 and have been known to fire arrows and fling rocks at low-flying planes or helicopters on reconnaissance missions. 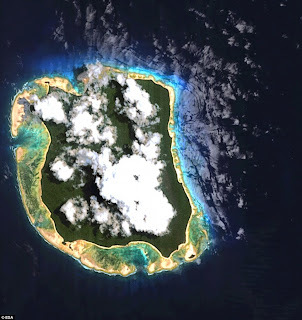 Located in the Bay of Bengal, North Sentinel Island belongs to India and remains an enigma, despite being populated for an estimated 60,000 years. Untouched by modern civilisation, very little is known about the Sentinelese people, their language, their rituals and the island they call home. [Left] This satellite image taken by NASA shows the untouched North Sentinel Island, which is about the size of Manhattan. It is too dangerous to approach them due to their hostility to outsiders, meaning they are rarely photographed up close and almost never seen on video. Most of the photos and video clips that do exist are of poor quality. There are also conflicting reports on the tribe’s population, with most estimates putting it in the range of a few dozen to a few hundred. 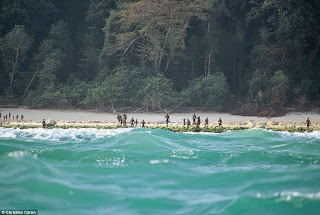 It’s still unclear what impact the 2004 tsunami had on the population and the island, which is part of India’s chain of Andaman Islands, although the uncontacted tribe managed to avoid being wiped out. After the tsunami one member was photographed attempting to fire an arrow at an Indian Coast Guard helicopter. 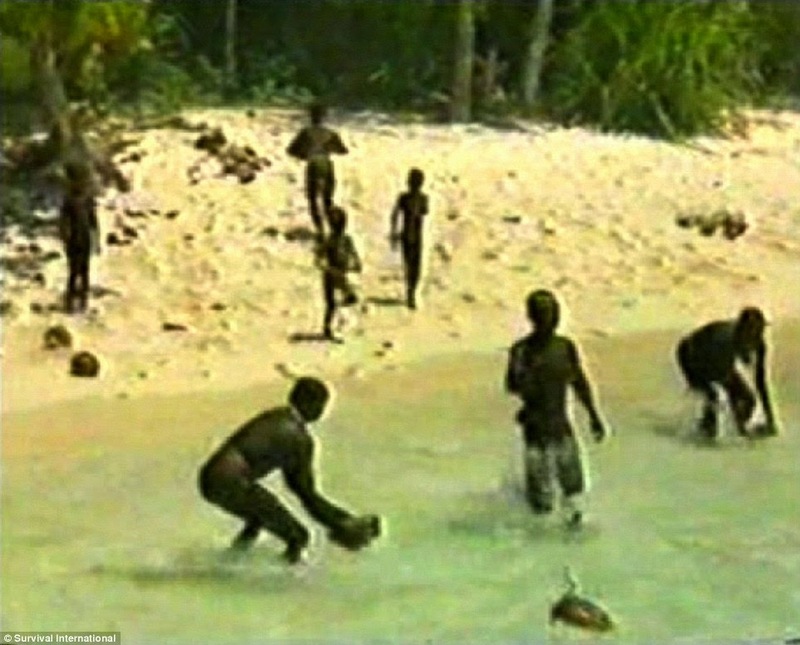 Often referred to as a ‘Stone Age tribe’ – a title that advocates take offence to, as its members have adapted over time – the Sentinelese may be the most isolated tribe in the world, with the Indian government choosing not to meddle in their affairs. [Left] The tribespeople are rarely photographed or recorded on video; the only existing images or video clips tend to be of poor quality. The government made several failed attempts to establish contact, but has abandoned all attempts and allows the tribe to live how it chooses on an island that is about the size of Manhattan. 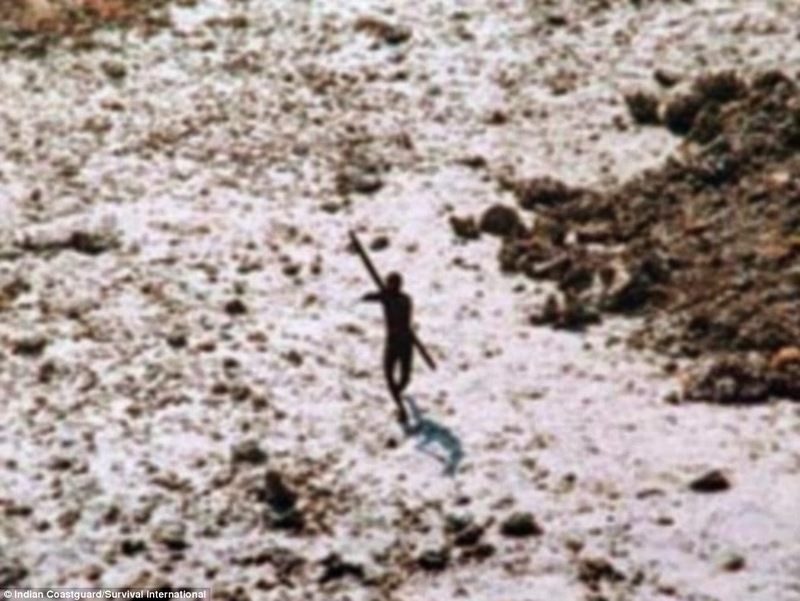 Indian authorities have gone as far as making it a crime to try to make contact with the Sentinelese. It is illegal to go within three miles of the island. 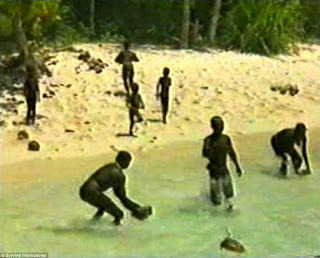 While privileged people are eating £15 burgers and splashing £100 on new trainers, the near-naked Sentinelese are surviving off the land and hunting for sea creatures. 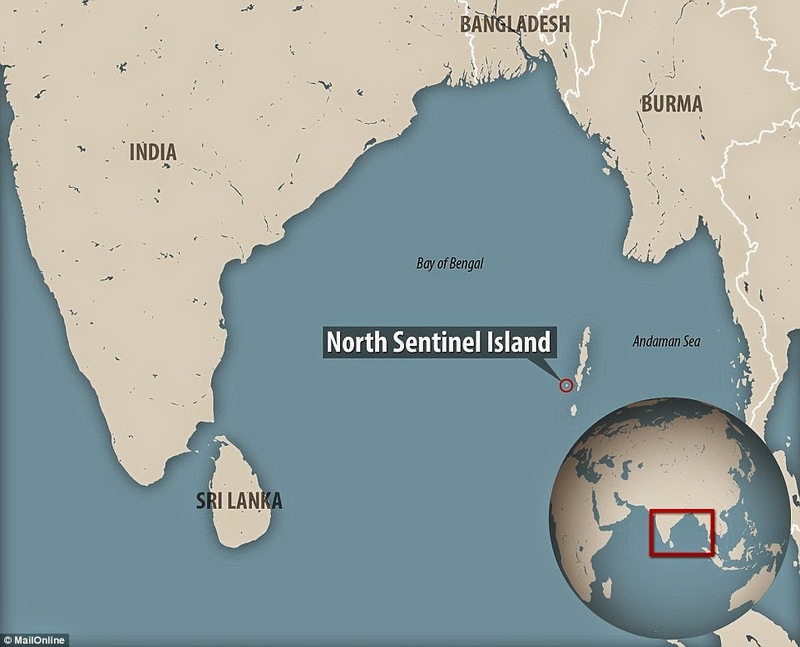 [Left] To protect the Sentinelese people - and visitors - the Indian government has established a three-mile exclusion zone. But the waters surrounding the island appear to be under threat by even more illegal fishermen. Survival International reported late last year that it had received reports that fishermen are targeting the area, with seven men being apprehended by the Indian Coast Guard. One of the fishermen reportedly stepped foot on the island in close proximity to the tribe’s members, and he managed to leave unscathed. [Left] Survival International said the islanders are ‘extremely healthy, alert and thriving’, but their fishing waters are being threatened. Survival International, which advocates for tribal peoples’ rights, describes the Sentinelese as ‘the most vulnerable society on the planet’ as they are likely to have no immunity to common diseases such as flu and measles. Due to their complete isolation, the chances of them being wiped out by an epidemic are very high, according to the organisation. In a statement, Survival International’s director, Stephen Corry, said: ‘The Great Andamanese tribes of India’s Andaman Islands were decimated by disease when the British colonised the islands in the 1800s. 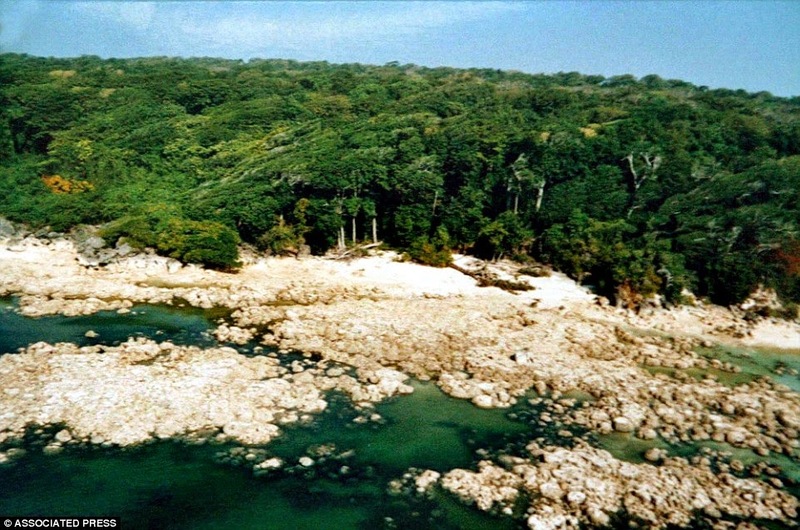 [Left] This aerial image shows the dense tree canopy on the island, which has remained untouched by modern civilisation for centuries. The organisation said the islanders are ‘extremely healthy, alert and thriving’, despite threats from the outside world and their 'old world' way of life. Their hostility towards outsiders can at least be partially attributed to past conflicts. Survival International said 'the outside world has brought them little but violence and contempt'. 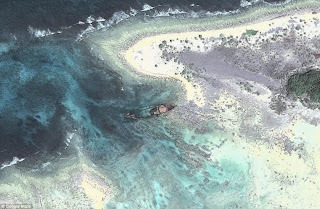 [Left] This aerial image from Google Maps shows a shipwreck off the coast; clashes with salvagers have left several tribespeople dead. In the late 1980s and early 1990s several tribespeople were killed in battles with armed salvagers who visited the island to recover iron and other goods from a shipwreck.